The world of cryptocurrencies can seem as alien as it is exciting―even if you aren’t interested in investing yourself, it can never hurt to be hip to the explosively popular tech trend. 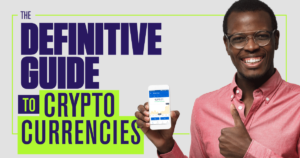 Cryptocurrency is digital currency backed by a secure network instead of a bank, which can be bought, sold, and traded like stock in a company in exchange for other cryptocurrencies, fiat currencies, or goods and services. The market to buy, sell, and trade cryptocurrencies, similar to a stock market like Dow Jones and NASDAQ. Bitcoin was the first decentralized digital currency to be mined and made public. A wave of new cryptocurrencies soon followed the introduction of Bitcoin using the same or similar crypto algorithms. Cryptocurrency has seen support and investment from everyone from tech pioneers to venture capitalists to teenagers. Famous for their association with the founding of Facebook, these twins have taken to the crypto game in a major way. They invested $11 million in Bitcoin in 2013 (Now worth more than $1 Billion). In 2015, they created the Gemini crypto exchange. Ohio teen invested his life savings into an altcoin at the age of 15 and has since made a career out of cryptocurrencies. In 2015, he invested $12,000 into currencies like Ethereum which turned into a $350,000 portfolio within a year and founded his investment advice company, Cryptocurrency Financial. Blockchain computing is the technologic backbone of cryptocurrency that allows it to be a secure and public platform. MedRec is a project aiming to manage medical record access using the backbone of the Ethereum blockchain to allow patients and doctors access to medical records, share medical records across multiple providers and authenticate user information for secure medical records. Digital Asset provides financial institutions a distributed ledger using blockchain technology to serve clients like Australian Securities Exchange (ASX) and Depository Trust & Clearing Company (DTCC). Dubai has started an initiative to implement a blockchain strategy with the aim to increase government efficiency by digitizing an estimated 100 million documents per year. It will create and energize business using the technology and improve the international Dubai experience with faster and more secure travel documentation like visas and licenses. Some want blockchain technology to reduce regulation and increase anonymity. Monero is a cryptocurrency that operates on the basis of absolute privacy of transactions and users. No personal identification required. Transactions and sending/receiving addresses are untraceable. Fungibility prevents blacklisting by vendors and exchanges. Sell percentages of a new cryptocurrency in exchange for funding through fiat currency or other cryptocurrency. Less restrictive than traditional bank and venture-capital funding. There is a lot of uncertainty surrounding cryptocurrencies, both as a concept amongst laymen and as a stable market for would be investors. Have you ever, or do you now, own Bitcoin? There is legitimate concern for online security as evidenced by past hacks of cryptocurrency exchanges. Cryptocurrencies have been called a major bubble. A bubble occurs when investors drive the demand of an asset to a price far beyond its realistic or rational value. A crash, or bubble pop, occurs when a majority of asset investors try to leave the market at the same time which then causes major losses. Cryptocurrencies have been shown to be incredibly volatile. Bitcoin started in January 2017 just under $1,000 per coin, rising to a peak of over $19,000 peak in mid-December 2017 – A 1,900% increase. Following the peak in December 2017, Bitcoin crashed to just over $6,000 in early February 2018, a 68% decrease. Part of this value decrease can be attributed to a fear of a regulation crackdown. The exchange Bitfinex and cryptocurrency Tether were subpoenaed by U.S. Commodity Future Trading Commission for failing to verify the $2.3 billion of tether listed on the market. Investors and believers in cryptocurrency claim prices will stabilize and climb back up. Mechanisms to enter the crypto market will increase investment. Whether you consider it a way to make easy money, a financial fad, or a vehicle for revolution, it is a great time to learn about the explosively popular world of cryptocurrency!